Cubism was a twentieth century avant-garde art movement that revolutionized European painting and sculpture, and inspired related movements in music and literature. In cubist artworks, objects are broken up, analyzed, and re-assembled in an abstracted form—instead of depicting objects from one viewpoint, the artist depicts the subject from a multitude of viewpoints to present the piece in a greater context. Often the surfaces intersect at seemingly random angles presenting no coherent sense of depth. The background and object (or figure) planes interpenetrate one another to create the ambiguous shallow space characteristic of cubism. The impact of modernism was a breakdown of unified cultural perspective that mirrored the loss of a unified pre-modern culture in the hubbub of urban life. This phenomenon was expressed in numerous forms, none more stark or striking than in cubism. Leading artists of the movement included Pablo Picasso, Paul Cézanne, and Georges Braque. Georges Braque and Pablo Picasso, then residents of the Montmartre quarter of Paris, France, were the movement's main innovators. 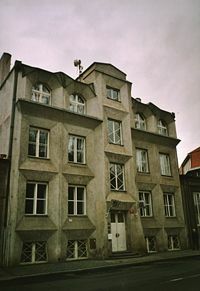 After meeting in 1907, they began working on the development of Cubism in 1908, and worked closely together until the outbreak of World War I in 1914. It is believed by many that the work of Cézanne may have sparked the movement. French art critic Louis Vauxcelles first used the term "cubism," or "bizarre cubiques," in 1908 after seeing a picture by Braque. He described it as "full of little cubes," after which the term quickly gained wide use although the two creators did not initially adopt it. 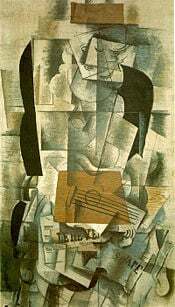 Cubism was taken up by many artists in Montparnasse and promoted by art dealer Henry Kahnweiler, becoming popular so quickly that by 1910 critics were referring to a "cubist school" of artists. However, many of the artists who thought of themselves as cubists went in directions quite different from Braque and Picasso. The Puteaux Group was a significant offshoot of the Cubist movement, and included artists like Guillaume Apollinaire, Robert Delaunay, Marcel Duchamp, his brother Jacques Villon, and Fernand Léger. In 1913 the United States was exposed to Cubism and modern European art when Jacques Villon exhibited seven important and large drypoints at the famous Armory Show in New York City. Braque and Picasso themselves went through several distinct phases before 1920, and some of these works had been seen in New York prior to the Armory Show, at Alfred Stieglitz's "291" gallery. The second phase of cubism, beginning in 1912, is called "Synthetic Cubism." Unlike analytic cubism, which fragmented an object into its composing parts or facets, synthetic cubism brought many different objects together to create new forms. Distinct superimposed parts were painted or often pasted onto the canvas, one effect of which was the introduction of brighter colors into cubist space. This phase constitutes the birth of the collage and of papier collé. Picasso invented the collage with his Still Life with Chair Caning, in which he pasted a patch of oil cloth painted with a chair-caning design to the canvas of the piece. Braque, interested by Picasso's technique, first employed papier collé in his piece Fruitdish and Glass. Papier collé consists of pasting material to a work much in the same way as a collage, except the shape of the patches are objects themselves. For example, the glass on the left in Fruitdish and Glass is a piece of newspaper cut into the shape of a glass. While Braque had previously used lettering in his compositions, the two artists' synthetic pieces greatly developed this idea. Letters that had hinted to the objects, became objects themselves. Newspaper scraps are among the usual items the artists pasted to their canvases, but they also used wallpaper, paper with a wood print, advertisements, or other types of scraps. Besides employing mixed media, Picasso and Braque varied their paint applications with decorative painting techniques such as combing, faux graining, and adding sand for texture. They often drew objects and added shadows with graphite or charcoal, mixing drawing and painting techniques. Picasso especially made use of pointillism and dot patterns to suggest transparent planes and to differentiate space. Gertrude Stein famously reported the remarks of Picasso and Braque, viewing camouflaged military equipment on parade in Paris at the beginning World War I. "We did that," Picasso said. "That is cubism." The new MARPAT and APU camouflage patterns have returned to the method of sharp edges used to depict softer shapes. Paris before World War I was a ferment of politics and movements. Anarcho-syndicalist trade unions and women's rights movements were especially new and vigorous. There were strong movements around patriotic nationalism. Cubism was a particularly varied art movement in its political affiliations, with some sections being broadly anarchist or leftist, while others were strongly aligned with nationalist sentiment. There was also an ideological influence on cubism from the artists of Italian Futurism. A prime example of cubism in music was given by composer Igor Stravinsky in his Piano-Rag-Music, for solo piano. It was written during Stravinsky's stay in France around 1919, as a result of contact with American popular music (ragtime culminated, at that time) from the early '20s. Elements reassembled were rhythmic and harmonic segments from ragtime and polyrhythm, bitonality and melody from his Russian influence. Cubism also was adapted into literature, especially poetry, by the likes of Guillaume Apollinaire, Max Jacob, Gertrude Stein, and Pierre Reverdy. Such poets adopted a number of techniques which could be classed as close to Analytic Cubism (destruction of grammar, strange or absent punctuation, free verse, etc.) Others were close to Synthetic Cubism, especially in the case of Guillaume Apollinaire, who fused poetry and drawing in caligrammes; created collages involving postcards, letters and the like. It should be noted that Cubist poetry frequently overlaps with Surrealism, Dadaism, Futurism, or even more diverse movements such as Vicente Huidobro's Creationism. This page was last modified on 20 July 2013, at 17:01.